This one-shot marks the passing of the baton from the Secret Invasion arch to the new Dark Reign moniker. Unsurprisingly it picks up exactly where the last frame of Secret Invasion #8 left off, with Osborn gathering a group of some of the most preeminent baddies for a conference room showdown. The entire story is dialogue-driven but that's actually a good thing, as this sort of thing seems to be one of Bendis' real strengths. Osborn's proposal is a simple one; everyone gets to keep doing what their doing as long as they agree to do so under his jurisdiction. Of course, figures such as Dr. Doom and Namor aren't entirely comfortable submitting themselves to the control of someone such as Osborn. However, the former Green Goblin seems to have an ace up his sleeve, in the form of a 'friend' of his who hides in the shadow behind a door. Whatever this entity is, it seems to sway everyone into consenting to a somewhat unstable alliance. However the best part of this one-shot comes at the end when we get a textbook example of just how mentally unstable Osborn really is. 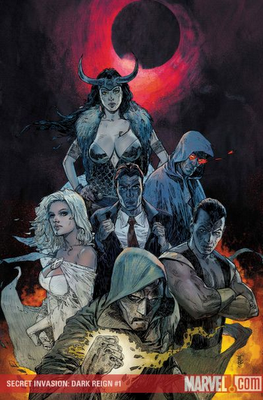 It reads like a set-up for something better, and in reality it's really nothing more than that, but Bendis and company make this required reading for anyone who wants a taste of whats to come in the Marvel U. So begins the exodus of Tony Stark, and the downfall of S.H.I.E.L.D. 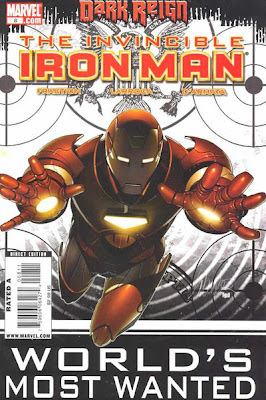 Invincible Iron Man rushes straight into the Dark Reign story arch, with little explination. Stark has taken the blame for the Skrull invasion, has been stripped of his status as director of S.H.I.E.L.D., and is now left to watch as Norman Osborn is put in charge. The issue begins with Starks right-hand woman Maria Hill clearing out her desk at S.H.I.E.L.D. It's a great scene that reveals just how much the position of Commander meant to her, but how glad she is to be leaving the now corrupt organization. Matt Fraction keeps the reconciliation coming as Iron Man flies around the ruined S.H.I.E.L.D. heli-carrier, surveying the damage and ruminating on his new role in an Osborn-controlled world. We also get some sexual tension in the form of an upgrade of Pepper Pot's repulsomagnetic chest piece by Stark, which is as about as endearing as it gets between these two. Stark's final act of aggression towards Osborn comes in the form of a crippling computer virus that re-ups Stark's status as the most wanted man alive. I loved the way Fraction dealt with the Secret Invasion aftermath in this issue; he keeps proving himself time and time again as one of the best writers Marvel has in their stable. I also really like the direction this series is taking; it's safe to say that as long as Dark Reign is in effect, this book will chronicle the continuing battle between Tony Stark and Norman Osborn. I'm not really sure how Dark Horse is classifying this series, I was under the impression that the first one was a one-shot. 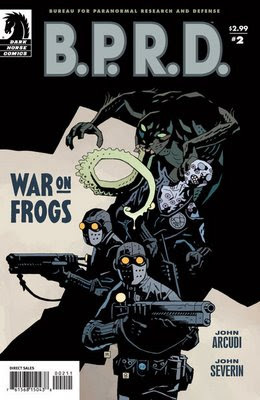 Regardless of where it fits into the comic collector lexicon, this second book in the War on Frogs series requires no prior reading. It's a straight-up, bloody man versus monster story along that on more than one occasion recalls James Cameron's Aliens. We have our stereotypical military guys; the newbie, the grizzled leader, and the panic-y private. They're pitted against an enemy they don't fully understand in an environment they can't escape from, in this case the bowls of a beached ship. One by one, members of the team are eliminated in the most gruesome manner possible by their unseen foe. By the end, there's one man standing and help is nowhere in sight. It's fairly formulaic, but entirely enjoyable in its own right. John Severin's first foray into the BPRD universe as an artist is highly successful and, strangely enough, recalls the old Aliens books that Dark Horse used to publish (I know I'm laying it on heavy with the Aliens allusions, but read it and you'll see what I mean). The War on Frogs seems far from over, so my guess is we'll be seeing a few more of these in months to come. Marvel's rekindling of the character of Deadpool under the creative direction of Daniel Way has to be one of the smartest decisions they've made this year. To me, Deadpool is one of the most interesting character's in Marvel's stable; a superhero who doesn't take himself, or anyone else for that matter, too seriously. Way's writing reflects this in exactly the way it should, including the return of the famous 'yellow boxes' which detail Deadpool's internal dialogue in an often humorous fashion. And I haven't even mentioned the art of Carlo Barberi, who provides a stylized yet realistic world for Deadpool to inhabit. This month's issue finishes up the zombie-infested plotline introduced last month in a uniquly satisfying manner. 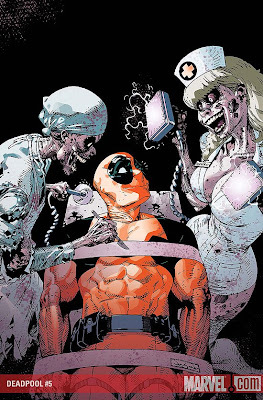 Perhaps one of the best moments is the two-page spread towards the end where Deadpool demolishes a castle to the tune of Bachman-Turner Overdrive's "You Ain't Seen Nothing Yet"; it's comic book art and witty writing at its finest. If you're not already reading Deadpool, do yourself a favor and pick up the next issue, as it's the beginning of a new storyline; always the perfect jumping-on point for new readers. Deadpool is exactly what a comic should be; darkly funny and undeniably entertaining.